Sling training means unstable training with your own bodyweight. You train full movement sequences and muscle groups in order to improve not only strength but coordination. Pulley sling trainers extend this form of training significantly with alternating and rotating exercises. Sling training is the allrounder of training forms and the ideal basis for your fitness training. Sling trainers might seem simple at first but don’t let that fool you: they offer a versatile and effective training ranging from full body exercises to isolation exercises. Everything you need is a suspension point and your own bodyweight. With a sling trainer you always have a complete gym at hand. A sling trainer is a training tool for bodyweight training that helps you optimally adjust your training resistance – i.e. your bodyweight – in every exercise. To illustrate this principle think of a rowing movement. You pull your body up until your chest is at the same height of your hold point. The more horizontal you position yourself the bigger the portion of your bodyweight becomes that you have to lift in every repetition. With a sling trainer you can choose the angle of your position inch-perfectly so you always have the right training resistance for your workout. This principle can be applied to every sling trainer exercise. Sling training doesn’t train isolated muscles individually but several muscles in combination. This is not only closer to real-life demands but also more effective. You don’t simply train more structures at the same time, you also improve inter- and intra-muscular coordination. The straps don’t offer stable hold, especially your deeper-lying musculature has to work more to keep a steady position. This improves the interplay of muscle groups, your body can work more efficiently, and you significantly improve your body perception. A positive side effect: you burn more calories in short workouts of 30 to 45 minutes than when training isolated muscles. Even though training with a sling trainer is versatile and effective, common sling trainers have a significant disadvantage: both straps are fixed at the same anchor point and have to have the same length at all times. This restricts the number of possible exercises and won’t allow alternating exercises. Dynamic sling trainers by aeroSling have the unique deflection pulley which allows for a wider spectrum of exercises and an increased instability that makes sling training even more effective. The main rope of aeroSling sling trainers, to which the handles are connected, can run over the deflection pulley with its full length. This has two advantages: first, the athlete has to actively counter the instability which increases the coordinative aspect of the training. Secondly, this allows for whole range of additional exercises that allow you to move arms or legs independently from each other. Alternating and rotating movements expand sling training with dynamic exercises that static sling trainers can’t offer. aeroSling sling trainers are premium-quality training products for athletes with highest demands. Only high-quality training tools can guarantee long-time fun during training and, thus, success. Suspension trainers by aeroSling are made of materials coming from climbing sport. They are used to tough conditions and can be used in any wind and weather. The maximum training load of 200 kg is significantly higher than market standards. The aeroSling ELITE is incredibly well made, easy to use, adaptable for all levels of fitness and can be used to work practically any muscle group. It nestles wonderfully into my health philosophy, a welcome addition to the arsenal of body weight workout equipment. I have been in the training business for about a decade. I have seen and used just about everything on the market. The aeroSling ELITE is without a doubt in a class all by itself. I am a full believer of being able to handle and work your own bodyweight through strength and flexibility. This piece of equipment is simply an extension of your body. It can be used for strength, power, flexibility, coordination, and whatever else your creative mind can come up with. I use it for my NBA and professional clients all the way down to my everyday fitness enthusiasts. The aerosling is not a fad or a thing to do. It is here to stay. Thank you very much for this piece of equipment – perfect for anywhere anytime. It brings floppy muscles back in shape and leaves room for one’s own creativity. The fun factor is guaranteed! Suspension trainers are the all-in-one tool of functional training. You can train strength, coordination, and mobility and only need your bodyweight as training resistance. What is the aeroSling Sling Trainer? At any time the main rope can slide along the suspended pulley. This means that the trainee has to invest a higher amount of balance and coordination compared to static sling trainers in order to stabilize themself during the exercises. This also demands a greater investment of strength. Thus, the instable training with the aeroSling suspended deflection pulley trainer demands and develops a better body control and strength than common static sling trainers in the same amount of time. aeroSling training, therefore, is significantly more effective. On the one hand, the suspended deflection pulley gives you new variations of existing exercises, e.g. alternating exercises. During biceps curls, e.g., you can alternatingly train your left and right arm instead of working them simultaneoulsy. This way you can better dose you training and in contrast to one-arm barbell curls your ‘inactive’ side always works to stabilize your body. On the other hand, the suspended deflection pulley gives you completely new exercises that a static sling trainer simply can’t offer. The so-called power pulls, e.g., is a great upper-body exercise that challenges your upper body muscles and coordination. It will give you everything that common push ups or butterflies will give you with the addition of a great core and arm training. Should you have slight doubts whether sling training with a suspended deflection pulley could be too difficult for a beginner we can put your mind at rest here. The great thing about sing training is the possibility to adjust your training load infinitely variable by just changing the angle in which you position yourself towards the suspension point. So should an exercise become too difficult because of the suspended deflection pulley you can easily change your angle into a degree in which you can do the exercise with problem. The additional training impulse created by the instability of the suspended deflection pulley will easily make up for the reduced training load you are moving. And should you nevertheless prefer to do a specific exercise without the suspended deflection pulley you can always just block it. aeroSling sling srainer vs. static sling trainers? The basic principles of sling training are the same as for other sling trainers. This means that all exercises that work with static sling trainers also work with the aeroSling Sling Trainer. What is the difference between the aeroSling XPE, ELITE, and ELITE Plus? The differences between the aeroSling versions can be summarized like this: The aeroSling XPE has, in contrast to the aeroSling ELITE (plus), no handle carabiners, but the handles are fixed to the main rope. Thus, the aeroSling XPE does not offer the same degree of extensibility as the aeroSling sling trainers. The handles of the aeroSling XPE are, like the ELITE handles, made of texturized, glass-fiber reinforced plastic (GRP) in gym quality and are very light, yet very durable, and easy to clean. This makes the aeroSling XPE a very light sling trainer that can be adjusted very quickly and is low-maintenance. The aeroSling XPE is the perfect sling trainer for beginners, travelers looking for light training equipment that can replace a complete gym, and gyms and coaches that don’t want to miss out on the advantages of the suspended deflection pulley yet need a sling trainer that is easy to maintain. The aeroSling ELITE with its modular build-up is aimed at advanced sling training fans that appreciate the extensibility of the aeroSling ELITE. The carabiners that connect the handles to the main rope make for an unmatched variability that no other sling trainer can offer. Whether you use official aeroSling accessories like the Flex Handles, connect it to the blackPack sandbag as counter weight, or you connect both carabiners to use the one-hand-mode – the aeroSling ELITE offers the most diversified sling training in the world. The second main difference between the aeroSling ELITE and XPE lies in the handles. The handle of the aeroSling ELITE has integrated foot straps that can be adjusted. Simply push the handle up or down and you can adjust the size of the straps. The suspended deflection pulley is the same with the aeroSling XPE and aeroSling ELITE – a roller-bearing pulley. You can upgrade both versions with our aeroSling UltraPulley or you go straight for the third aeroSling version: the aeroSling ELITE Plus. The aeroSling ELITE Plus contains the ball-bearing deflection pulley that is significantly smoother and, thus, more instable. The handles are made of aluminum and coated with plastic for optimal grip. 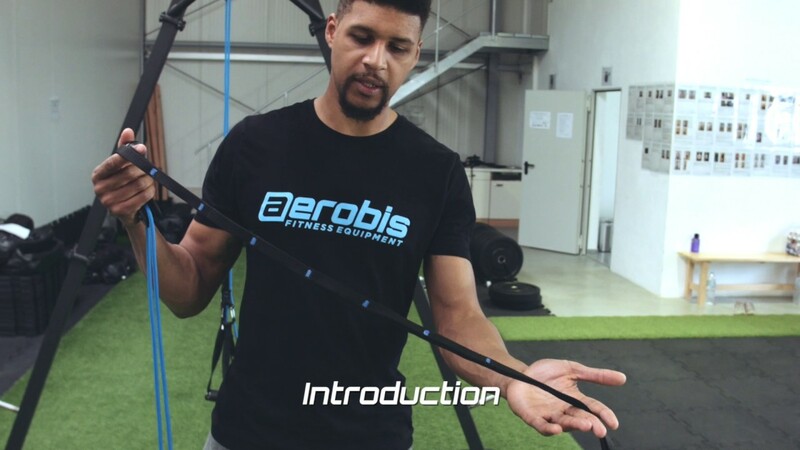 With its high-quality accessories the aeroSling ELITE Plus is the best sling trainer we have ever built and is mainly aimed at advanced sling training fans, personal trainers, or people that simply don’t want to make any compromises in their workouts. How much space do I need to train with the Sling Trainer? 80cm on left and right side of the anchor point (arm span). Minimum of 260cm from anchor point in direction of use. These values should be seen as ideal in order to make use of the full exercise potential of the Sling Training. Where and how do I install the Sling Trainer? Sling trainers are fitness equipment that you can use indoors and outdoors. Due to the low weight and the small size of the sling trainers, they are mobile and can be taken everywhere. The aeroSling Sling Trainers can be attached to various suspension points both indoors and outdoors. Where can I mount the aeroSling Sling Trainers indoors? Door – The aeroSling Sling Trainers all have a door anchor that can be used to clamp the Sling Trainers between the door and the door frame. Wall or ceiling – The Mount wall and ceiling mount is available as an accessory. The aeroSling Sling Trainers can be fastened with the anchor sling or a karabiner in the bracket. Where can I mount the Sling Trainer outdoors? Tree – A tree can be found almost everywhere. Simply put the aeroSling Sling Trainer’s anchor sling around a branch or trunk and pull it tight. Lantern pole – The same fixing principle using the anchor sling is also possible on a lantern pole. Climbing scaffold & Co. – Everything that has a stable construction can be used as a suspension point. For example on a climbing frame you can fix the sling trainer again with an anchor sling with or without carabiner. Please make sure that the suspension point can withstand the resulting forces without any problems. To perform all exercises with the sling trainer, the suspension point should be at least 30cm above head height. Here you can see some possible mounting options. Where and how do I install the door anchor? You may install the door anchor on any sturdy door, granted that the distance between door and door frame is not too tight. We recommend using the product in direction of door closure only. This means that the door anchor shall always be on the side of the door that points away from you when opening the door. Can I install the aeroSling Mount on the ceiling? Yes, the product includes ceiling mount screws which are specially tested for this purpose. For any type of installment, please consider the requirements and conditions of the ceiling or wall. At which height must the Sling Trainer hang? The installation of the aeroSling Sling Trainer does not have to follow specific height requirements. Nevertheless, please consider the following: measuring from its handles, the hanging aeroSling in its full length (not with shortened rope) should hang approx. 20cm above the ground. At the same time, the deflection pulley should hang higher than head-height. Please also consider that the space requirements increase the longer the Sling Trainer is set up, because the movement radius becomes bigger. The maximal elongation is 195 cm (77 in) excluding the anchor sling and 290 cm (114 in) including the anchor sling. If your anchor point is higher you can add additional anchor slings (100 cm / 40 in each) to increase the length of the installation. For more information please refer to this chart. Maximum Userweight aeroSling Sling Trainer? Will the aeroSling hold my entire bodyweight? Yes! Exercises such as dips or pull-ups are safe to do at a maximum bodyweight of 200 kg. What does the aeroSling XPE/ELITE weigh (re: transport)? All sling trainers weigh less then 1 kg and are ideal to be brought with you on vacation. The aeroSling ELITE weighs 750 g, the aeroSling ELITE Plus weighs 900 g, the aeroSling XPE weighs only 450 g.
How do I use the grip knot of the aeroSling? It is quite simple to handle the adjustable knot correctly: to shorten the length of the rope, hold the main rope (round, thin rope) with your right hand (if right handed) below the adjustable knot. Pull the loop of the adjustable knot with thumb and index finger of your left hand. Just a light tug will be enough. The adjustable knot may be damaged if the loop is pulled upwards completely. After untying the adjustable knot, use your whole left hand to grip around the thick adjustable knot. With the same hand, you can now slide the adjustable knot upwards on the main rope. In order to lengthen the main rope, use your right hand to hold the main rope above the adjustable knot and then move the adjustable knot downwards with your left hand. Or you simply take a look at this video because it shows you the necessary steps. How do I tie the grip knot of the aeroSling after undoing it? You will be able to tie the adjustable knot by yourself. Check out this video for guidance on how to tie it. Can I block the deflection pulley of the aeroSling? Yes, you can block the pulley. The safest way to do so is to hook an additional carabiner into the aeroSling’s rope. The technique will take a few times to get used to but then it’s simple. You can also block the aeroSling by twisting the main rope three or more times around itself. As soon as there is tension on the main rope both rope sides will tighten around each other and the rope will not be able to move over the pulley. Another way is to hook the grip carabiners to each other, which provides the user with only one grip. During training in the “one-hand modus”, the deflection pulley is completely blocked. What are the differences between the standard deflection pulley and the Ultra Pulley? Our aeroSling sling trainers can be used with two different pulleys. For one, there is the standard deflection pulley that comes with our aeroSling XPE and aeroSling ELITE. Then there is the Ultra Pulley that is installed in our aeroSling ELITE Plus and the aeroSling ELITE Sets PRO and TOP. The differences between the two pulleys can be found mostly directly inside the pulleys. The maximum weight load, however, is the same for both versions. The standard deflection pulley ist a roller-bearing pulley, while the Ultra Pulley is a ball-bearing pulley. So, while the standard deflection pulley offers a decent amount of instability and is quite challenging coordinatively especially for beginners and suspended deflection pulley training novices, the Ultra Pulley is aimed at professionals and experienced sling training fans that demand the highest degree of efficiency. To everyone that has no suspended deflection pulley experience we recommend the standard pulley. Should you feel the need to make your sling training even more challenging after several hours of training you can always install the Ultra Pulley. How you install the Ultra Pulley or change the deflection pulley on your aeroSling is explained in the following topic. How do I change the pulley? With every aeroSling version you have the choice which of our pulleys you want to use. Thus, you can use the Ultra Pulley with the aeroSling XPE as well as with the aeroSling ELITE. Changing the pulley is incredibly easy. Why the aeroSling should be the foundation of your training When you want to become fit, there is no way around the aeroSling suspended deflection pulley trainer. We tell you why the aeroSling is the best option when you want to train for strength, coordination, and every aspect of fitness. #aeroSling deflection pulley #suspensiontraining can be done anywhere. The integrated anchor sling enables you to fixate it on doors, trees… or traditional gym machines 😏 as beautifully proven by @spiritlifeexcellence 🙌🏻. 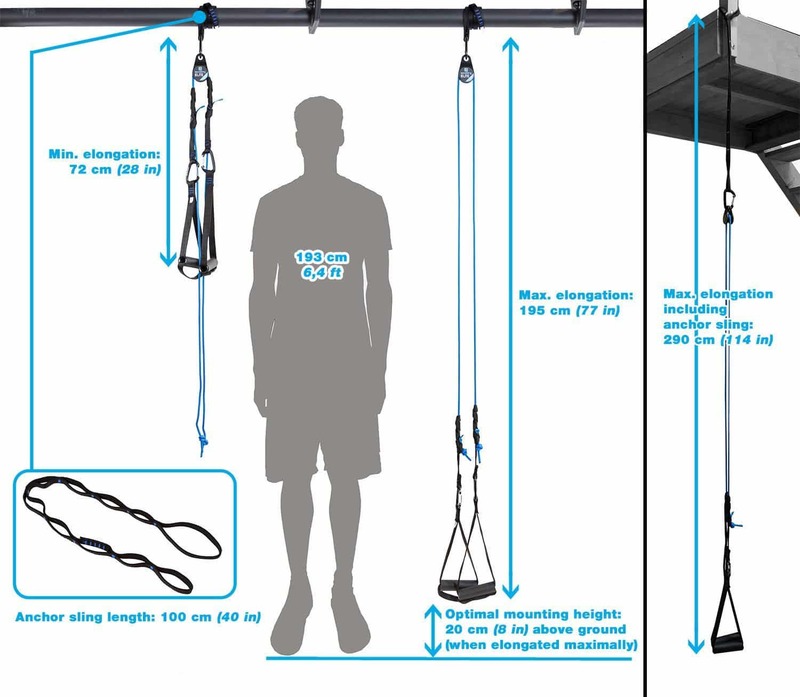 Train with aeroSling deflection pulley sling trainers in your fitness gym or wherever else you are! We help you to find the perfect aeroSling match for you. New aeroSling Suspension Trainer models in 2017 From now on, all aeroSling sling trainer models have changed. We’ll tell you what changes and what advantages these changes bring. Your sling training plan for the new year – part two Our New Year’s Workout continues: with the second part of our training we will get you closer to your best form and your goals for 2016 come even closer. Your sling training plan for the new year – part one We will help you realize your New Year’s resolutions for 2016. We will build a foundation with our training plan. Our training video shows you all exercises and you can workout immediately alongside the video. In the second part we build on this foundation and get you closer to your dream figure. Are bodyweight exercises enough to get really fit? Bodyweight exercises are very diverse and offer innumerable possibilities. But are they enough to become really fit and powerful? Rowing with the aeroSling – we show you the best variations (incl. video *only in german lanuguage*) Tutorial Thursday 28 covers a fitness classic: rowing. Read all about the movement and training variations of a basic functional movement.